Bushy and straight hedges (60 and 100 cm wide). This will especially be useful when you are planning a garden or adding the finishing touches to a balcony or roof terrace. Also, we improved the visual representation of these objects. For instance, the line menu will show a better image of the things you are selecting. Fences and railings have posts at the endings and hedges are less jumpy at the ends. We are currently working on a 3D representation of these elements; for the moment they will show in 2D only. 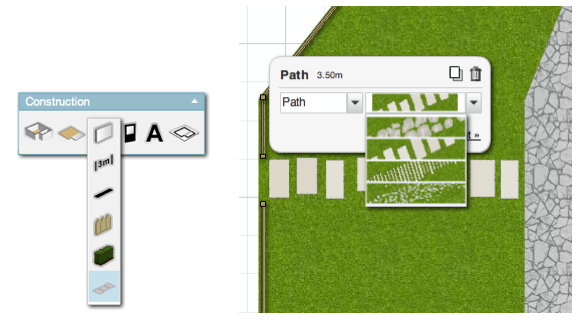 Also in time we'll add more types of paths, hedges, fencing and railings.